Uranium resources can be extracted from the ground in three ways: open pit, underground, and in-situ leach (ISL). 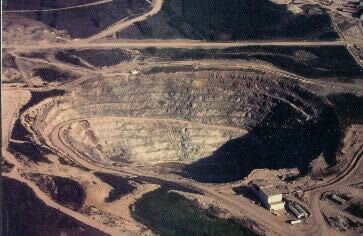 Waste rock or overburden (the material removed over the ore body) usually is stored near the open pit. Once the ore horizon is exposed, a series of benches or steps are cut into it to make removal of the ore easier. Within the pit, depending on the size of the mine, there maybe one or more roads cut into the sides for the huge earth/ore haulers to navigate the area. Pumps maybe utilized to dewater the pit. Less expensive than underground mining. New mines must follow much stricter environmental, safety and health guidelines than were in place during the last uranium boom. 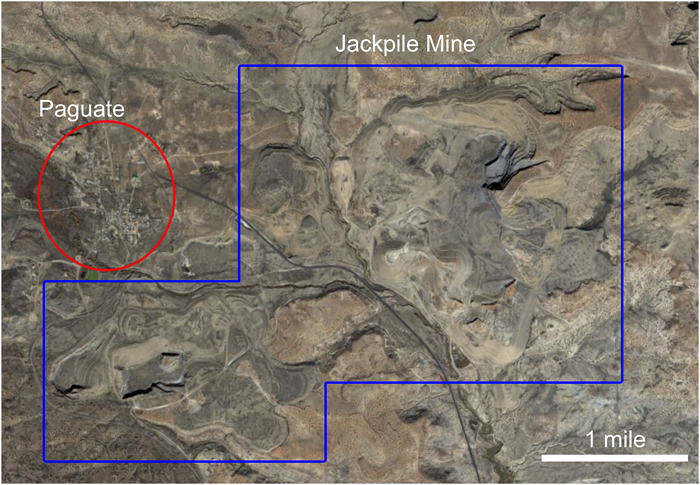 For example a new open pit would require a mine and reclamation plan with phased mining, backfill, and then final reclamation to minimize the dimensions of the footprint on the landscape. Bonding is required on the front end to assure all of reclaimation and safety costs will be covered. Tailings piles have to be built to completely different standards than the past with lower subgrades, synthetic liners, leak detection wells, and 40 acres maximum size. Dust control is required on new operations, and radon will be subject to strict MSHA working level requirements. Waste rock piles can be enormous. Remediation is extremely costly and time consuming. Groundwater restoration can be extremely costly. Mine workers’ health can be compromised due to dust and radon exposure. Nearby communities can suffer negative health impacts due to the dust, noise and other issues (drainage ponds breaking). Has a smaller surface footprint. Potential to seriously impact local aquifers and expensive to remediate. In old underground mines, dust, radon and diesel fumes were a serious threat to miners’ health because of poor ventilation. For both traditional underground and open pit mining, the rocks may have only a few percent (normally <0.3%) uranium in them. The uranium then has to be removed from the rock and concentrated. The milling process involves crushing and pulverizing the rock into very fine fragments and adding water to create a slurry. This slurry is then mixed with sulfuric acid or an alkaline solution to release the uranium from the host rock. Normally approximately 95 - 98% of the uranium can be recovered from the host rock. From this acid or alkaline solution, uranium oxide or yellowcake is precipitated. This is still not the purest form, and the uranium has to be sent to another plant to enrich it. The remaining rock slurry is pumped to a tailings dam. These tailings are exposed to the surface and heavy metals can be released into the environment. Only effective method to extract uranium from conventionally mined ores. Modern mills have more stringent laws governing their operation than old mills. Tailings are exposed to the environment and any remaining uranium or heavy metals can be released. Formerly placed on porous units to help remove the water from the tailings slurry. Potential for severe impairment of local groundwaters. pumping water from the formation and adding oxidant such as gaseous oxygen. For some units, a carbonate phase such as sodium bicarbonate (baking soda) is added to the solution to make ieasier for uranium to go into solution. Ideally, the pH of the solution is somewhere between 6.5 - 7.0 (close to neutral). This solution oxidizes the uranium in porous sandstones and make it easier to go into solution. These wells pump more fluid than is put down the hole to create a "cone of depression,"
the treated waters are refreshed with oxidant and cabonates (if needed) and sent back down hole to start the process again. after uranium has been depleted to its economic limits, regulations require ISR operations in the United States to be restored to prescribed standards to try to assure that potable sources of water are not impacted. In the USA, alkaline solutions are the preferred, and sulfuric acid and peroxide solutions are used at ISL operations in Australia. The New Mexico Bureau of Geology and Mineral Resources has produced a article on the next uranium boom and ISL. waste water disposal and the public fears.